I must admit to being a nay sayer of heavy distortion pedals. I’ve tried so many and have been regularly disappointed. So many have fallen short of really sounding like a high gain amp. For the few that had good tone, they’re often so noisy it’s hard to use in live settings. When I was at NAMM this year I happened to drop by the Empress booth. I found what I wasn’t expecting. A Heavy distortion pedal that sounded huge and wasn’t noisy. It’s fitting it’s actually called the Heavy. I had a moment where I thought I was in a NAMM daze. I’ve been trying distortion pedals and gates for 20 years. I’ve never settled down. There I was, a simple guy looking to settle down with a hard clipping device. I almost lost faith I would find the one. You know, someone that can really understand my desires. It’s a meat factory out there people. Wait, I’m talking about a pedal, right? I ensure you (and my wife) that my relationship with my clipping device is strictly platonic. The Heavy pedal is quite small for a two channel pedal. They managed to arrange it so that you won’t accidentally step on the switch you’re NOT aiming for. It’s quite compact and impressive they squeezed so many options onto this pedal. I love that I can switch channels with no noise or gaps in tone. I’ve actually used this to my advantage. Sometimes, I like to use a Strat onstage with high gain settings. Yeah, I know I’m looking for love in all the wrong places with those single coils. But, the gate is so good on the Heavy that I can actually use a Strat with a high gain sound live. For realz yo! Occasionally though, I need more sustain then the gate will allow. To deal with this, I set the second channel with the same gain, but no gate. When I hit the note I want to sustain, I simply switch the channel. It’s seamless! I’ve never liked gates. Nope, not never. No gates… Until now. I always wanted to find a gate that didn’t suppress the tone of the pedal. I wouldn’t dare say that the Empress has no noticeable change when the gate is engaged. There is a very minute change. You have to adjust your output a little. But, there is very minimal loss to the actual tone. It doesn’t sound like there is a blanket on your amp. You still get a present sound. I don’t feel the need add an EQ after the Heavy to make up the loss. The gate is very responsive too. I find my self using it quite a bit. There are three settings: off, natural and aggressive. I use the natural setting most of the time. But, for really heavy sessions, the aggressive is really useful. There is a master section with a Hi and Low adjustment. This is a nice overall EQ. This lets me find an overall tone to pair with whatever amp I’m using. Especially helpful in backline situations. Each channel also has a mid adjustment. It will either allow you to cut or boost the mids at 500, 250 or 2k. This is a super powerful feature! Because of the advanced EQ options on this pedal, I can bypass the pedal and not end up with a weak clean sound. Often, I have to adjust the eq on my amp specifically to work with a high gain pedal. I don’t have to with the Heavy. It allows me to really dial in the master EQ and EQ for each channel without messing with my primary clean sound. Since I’m becoming an old crank yanker, I will mention in the past I’ve hated pedals that add funky low end as an attempt sound like a closed back cab. Most that I have tried have added useless low end to give you the illusion of something bigger. This “illusion” is often problematic when recording. Empress have figured out how to add what they call “weight” without it getting in the way. It doesn’t sound hyped. 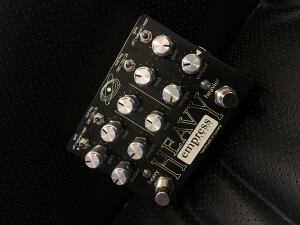 All the knobs on the Heavy are very responsive. You can dial in weight very specifically. The only drawback to some may be the pedal doesn’t run on batteries. Personally, it seems that most of my favorite pedals have special power requirements. The Heavy is 9v but it consumes 200mA. This means if you’re using the Voodoo Labs Pedal Power 2, you have to use one of the Line 6 outputs. The other six outputs don’t have enough mA to power the Heavy. Before you get into a tizzy, you won’t mind the power requirements when you hear the headroom the Empress Heavy has. A small pet peeve of mine has become the placement of the 9v jack. Seems like such a tweaky, nerdy thing to be concerned with. But, a poorly placed 9v jack is a real pain when you have to put modular pedal boards together on a regular basis. Let’s take the Klon KTR as an example. I find the placement of the 9v jack to be quite annoying. It almost always gets in the way of most patch cables. The Empress design was well thought out. I’ve been able to squeeze the Heavy on my pedal board in a number of ways without the 9v jack getting in the way. Some gain pedals tend to prefer certain amps. For instance, I have a Catalin Bread Dirty Little Secret that pairs well with my Princeton. I don’t find it to pair with larger amps as well. It’s very finicky. The Heavy seems to work across the board. I’ve used it with a Princeton, a JCM800, a Orange Tiny Terror and a Tweed Pro to name just a few. Each time it translated well. It even worked great as a front end to an amp sim. I preferred the Heavy to the modeled preamp/power amp drive in the sims. I have a lot of pedals. Sometimes I pull a pedal out just a few times to use throughout the year. Since receiving the Heavy, it’s been in regular rotation on my board. I don’t see this changing. It’s a keeper for sure.